After numerous leaks, speculations, and hypotheses, HTC has finally lifted the veil off of its flagship smartphone, the much-expected HTC One M9, a device that is trying to address many of the issues that the HTC One (M8) brought to the table. From the looks of it, the Taiwanese manufacturer is on the right path. It is sporting similar exterior design and, from the looks of it, it's doesn't seem quite different from the One (M8) in terms of size. 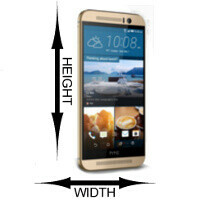 The dimensions are just marginally different, to be honest, and One (M8) users will feel in familiar waters. There's no use of describing what are the dimensions of the flagship, as we can conveniently show you how it stacks up against the rest of the smartphone world. Looks awesome. They reduced the bazels. More compact on sides and top bottom, and is 0.3mm thicker to compensate for larger battery. I'm sorry, I thought everyone was crying about how they would happily trade a bigger battery for a less thin phone? But its okay this site is infested with too many trolls anyway. Why is it so thick? Isn't this 2015?? Do you want them to fit the bigger battery in your A55? And of course, the Nexus 6 doesn't exist.